Rosetta Radiology is now able to provide their patients non-invasive Robotic Stereotactic Radiosurgery at the only CyberKnife facility in New York City. Rosetta Radiology, Manhattan’s premiere independent diagnostic imaging and radiation oncology center, is pleased to announce their partnership with Flushing Radiation Oncology in order to offer their patients access to the revolutionary CyberKnife radiosurgery system at the only facility in New York City to offer this state-of-the-art technology. The CyberKnife Radiosurgery System is the first and only robotic stereotactic radiotherapy platform able to deliver individualized precision targeted radiation therapy for tumors located anywhere in the body, without the need for invasive or uncomfortable patient immobilization. CyberKnife stereotactic radiotherapy is ultra-targeted, with the robotic arm directing the radiation beam tracking the tumor in real time during the treatment, adjusting with body movement and organ motion to avoid harming healthy tissues. Due to CyberKnife’s unparalleled image guidance software and ability to target the tumor more effectively, higher doses of radiation are able to be administered during each treatment session. This frequently translates into a significant decrease in the number of treatments necessary to effectively treat tumors when compared to conventional external beam radiation therapy. Dr. David Sherr, with over 20 years radiosurgery experience at North Shore University Hospital and New York Presbyterian Hospital/Weill Cornell Medical Center and who recently joined Dr. Alfred Rosenbaum in Rosetta Radiology’s radiation oncology division, said: “Given its ability to track tumors in real time during the radiosurgery procedure, Cyberknife is unquestionably the most advanced radiosurgery system available and allows for more effective treatment for many tumor sites." Cyberknife is particularly well suited to treat early primary lung cancers and achieves cure rates comparable to surgery without surgery’s discomforts and many of its risks. It requires less restrictive immobilization than most other stereotactic systems because of its real time tracking ability and unlike some other radiosurgery systems, can be used to safely treat centrally located lung tumors. Women with early stage breast cancer who have undergone lumpectomy and are appropriate candidates for accelerated partial breast irradiation (APBI) may also benefit from CyberKnife. There is emerging data that CyberKnife can be used to deliver a course of partial breast irradiation non-invasively in only one to two weeks without the need for indwelling devices that can be uncomfortable, unsightly and may be associated with an increased risk of complications. CyberKnife is able to treat primary and metastatic tumors of the brain, skull base, spine, head and neck region, kidney, adrenal glands, pancreas, and liver. It can also be used to safely and effectively re-treat tumors that have recurred in areas that were previously irradiated, and therefore not suitable for re-irradiation using conventional external beam radiation therapy techniques. Rosetta Radiology is very excited to now have the ability to offer its patients the advantages of CyberKnife robotic radiosurgery. 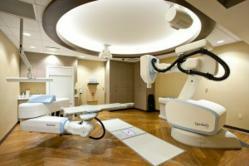 To learn more about treatment with CyberKnife Robotic Radiosurgery, please contact the team at Rosetta Radiology. Since its opening in the 1960s, Rosetta Radiology has served the city of New York with the highest quality radiation therapy and diagnostic imaging services. Pioneers in radiation oncology and experts in diagnostic imaging, Rosetta Radiology was one of the city’s first independently owned outpatient facilities. Now located at 1421 Third Avenue between 80th and 81st Street, Rosetta Radiology is fully accredited by The American College of Radiology and serves a vast patient population with the highest quality services for Mammography, Ultrasound, X-Ray, Breast Imaging and Biopsy, Breast MRI, Body MRI, CT Scanning, and Radiation Oncology. Known for their special combination of state-of-the-art technology and patient-centric care, the facility is led by their on-site radiologists and radiation oncologists: Dr. Alfred Rosenbaum, Dr. Stanley Rosenfeld, Dr. Emily Sonnenblick, Dr. Ayala Rosenbaum and Dr. David Sherr.